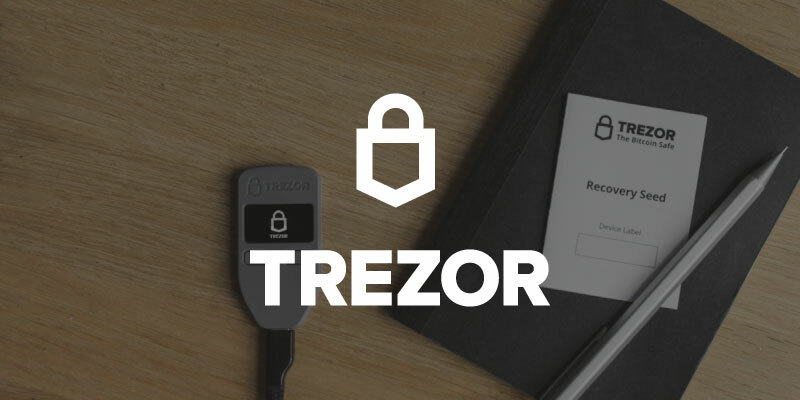 Trezor Wallet Review 2019: 10 Reasons to Buy Trezor today! If you’re collecting as many tokens as possible, then you need a reliable wallet. Over the years, I had the opportunity to try different kinds of cryptocurrency wallets. But lately, I’ve been solely using my Trezor bitcoin hardware wallet. And I’m very happy with it. Because it makes it easy for me to join hundreds of cryptocurrency airdrops. This is definitely my best hardware wallet. Check out my Trezor wallet review below. And you’ll understand why you should seriously buy Trezor to store your cryptocoins and tokens. This is the best hardware wallet I have reviewed! Is Trezor safe? Yes, totally. And it's super convenient to store your tokens and other cryptocoins. Buy Trezor and you won't regret it! 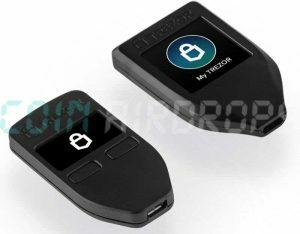 Trezor has been around for what we can consider ages in the crypto world. And there are good reasons that explain that longevity. First, it’s been developed by a reliable company, one of the pioneers of the bitcoin industry. Second, you won’t find any wallet as secure and as convenient as this one. Period. Third, it’s one of the cheapest hardware options you can find on the market. I’m more of a reading-type of guy. But if you prefer to get your review in video, I’ve created a quick one, that you can watch below. Hope you’ll like it. Not only is this wallet great for crypto airdrops, but it’s also nice if you want to buy bitcoin and HODL. First of all, I’ve already written an article about crypto wallets. So I won’t explain the difference between hot and cold or software and hardware. But feel free to read it, to have a better understanding of what we’re discussing here. Just keep in mind that a cold hardware wallet is the safest way to store your assets. And it’s also the most convenient. That’s why I’d recommend you to use one. If you’ve never heard this device, here’s a brief introduction. Satoshi Labs, a Czech company, released its product in January 2014. It was one of the first hardware cryptocurrency wallets to hit the market. And it quickly grew in popularity. Indeed, users loved the product. And they were thrilled to recommend it to their friends. Not to mention that the Trezor wallet reviews were really good. The company recently launched a new model. And users now have the choice between One and Model T. While the first one is the gold standard, the second one is a premium version with additional features. I bought mine over a year ago. So, my Trezor wallet review is more related to the first generation. But the Model T looks great – I just don’t have the need to upgrade yet. And I’ll update this article when I get it! In the case of a crypto-wallet, unpacking is a bit different from the other products. Because you must make sure that no-one has ever opened the box before you do. Or it wouldn’t be safe for you to store your coins and tokens: The wallet would be compromised. So, when you receive the clean-looking black package, verify that the holograms haven’t been tampered with. The Czech Republic company glued the box together – it’s impossible to open it without tearing them apart. And if the package is damaged, I’d recommend you to return it to Satoshi Labs immediately. And that’s everything you need. The device itself is made of black (or white) plastic – it’s very light. And you’ll see a small screen and two buttons on the front, and a USB port at the bottom. This simple design ensures that there are less weak spots – to send and receive and protect your crypto-assets. While the process is straightforward, you can find the whole process to get started in their guide. And I won’t spend time on the setup process in this Trezor review. Feel free to contact their support or do a quick Google search if you need help. But everything’s user-friendly. And I’me sure you can handle it, even if you’re not tech savvy. A word on your recovery seed – because it’s critical. You have to write the 24-word passphrase down on a piece of paper and store it in a safe place. Because it’s the only way to recover your funds if you break or lose your device, or if someone tries to steal them from you. I’d also recommend enabling the PIN code protection, to add a layer of security. But let’s talk about their web interface. It’s well designed, with two tabs and the list of currencies on the left. And even if you’re new to crypto, you’ll understand how it works in no time. When you switch to crypto, you can check your transactions, receive and send funds. While you can use Trezor with third-party interfaces and services, like Electrum, I’d recommend setting up the device directly in the web wallet interface. The short answer is: Yes, it is. But let me give you some more details here. Because that’s one of the reasons why you’re reading my Trezor wallet review now. As I mentioned above, experts’ Trezor wallet reviews have acclaimed this product. Because I’m no security specialist, I rely on the community and the experts who audited the device. And it has a reputation as a secure and transparent device, unlike some of their competitors’. Indeed, you can check both hardware and firm on GitHub, as everything’s open source and publicly available. On the user’s side, the device is empty when you receive it. And you need to install the firmware yourself. During the process, you can enable the PIN protection – as recommended above. You can also label the device and change your home screen. As a result, it’s really yours and it can’t be replaced by a fake. So is Trezor safe? YES! 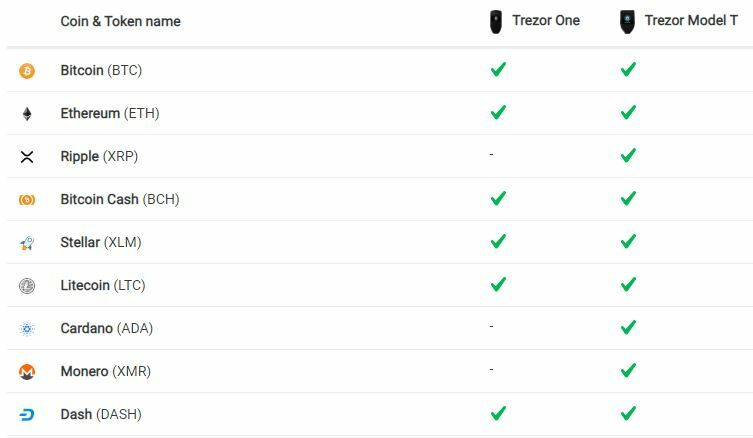 At the time I write this Trezor wallet review, there are over 700 coins and tokens that are supported by this cold wallet. And that’s more than any of their competitors – more than Ledger Nano for example. Name it, you got it: Bitcoin, ethereum, litecoin, dash, ripple, etc. You can even check the list of all the coins and ERC-20 tokens that are supported here. With the launch of the Model T, the One’s price has recently gone down. And it now costs 69 EUR (or about 79 USD). If you want to get the premium model, it will cost you 149 EUR (or about 169 USD). You can find a comparison of the two products side by side on their website. And if you wonder where to buy Trezor, I’d recommend visiting their official shop: shop.trezor.io. In their shop, you’ll find different accessories to improve your experience with this little device. I remind you that you can carry it around, either in your pocket or on your keychain. And you should protect it from dust, dirt or drop either with a leather case or a silicone case. Also, if you want to connect anywhere, Satoshi Labs offers small, tangle-free, charging/sync cables. They’re available in micro USB and USB-C. Finally, if you’re a bit paranoid about your cryptos, or if you really have huge sums to store, you should take a look at Cryptosteel. It’s a steel backup for your recovery seed. And it’s almost indestructible, unlike the paper card you’ll get in the box. This tool can protect your passphrase from fire and flood! Thank you for reading my Trezor review! I hope it’s detailed enough for you to make up your mind about Trezor bitcoin hardware wallet. If you’re wondering: Is Trezor safe? Yes, it is. And if you’re looking for the best hardware wallet, look no further. Because you’ve found it. This is the product you need to keep your cryptos safe. It’s been adopted by the crypto community and cherished ever since. Easy-to-use: It’s intuitive and you don’t need a special skill set to use it. Handy: It’s your one-stop wallet for all your cryptos. Simple: Designed for one job and one job only – keep your assets safe. Reliable: You can lose it or break it and you’ll still have access to your assets. Hundreds of cryptos supported: Bitcoin, ethereum, ripple, etc. Affordable price: The price just dropped by 20%! Offline wallet: The safest way to manage and trade your digital currencies. Premium support: Use support tickets or ask the community. Airdrop compatible: Use it to receive all your free tokens. This was my Trezor wallet review. I hope it helped you make up your mind. And I hope you’ll get one today! A hardware wallet to store and manage your tokens, or bitcoin Trezor is the ultimate solution: Reliable and secure.